(Newser) – The Queen of daytime television is planning an evening show. Oprah Winfrey will announce today her plan to launch a new show called Oprah's Next Chapter on her cable network. 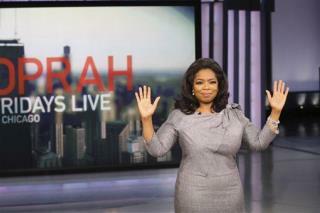 The hour-long series, to debut next year, will take Oprah out of the studio and around the world. "I'm going to take viewers with me, going to take celebrities I want to interview with me," she tells the Wall Street Journal. The Oprah Winfrey network (OWN) will have to convince advertisers to come along too. Her number are down from 10 million in the 1990s to 6.7 million viewers so far this season, the Journal notes. But Winfrey says she's fully invested in her new enterprise. "I am hands on, digging in there, looking through every tape," she says. "I'm not just up to my knees. I'm up to my thighs." Miss her already? Click here for the 9 best Oprah moments. Some of her shows are good. You just have to pick and choose. And, I would guess that NONE of the earlier comment writers have THEIR own show. OPRAH WINFREY: Let Love Lead The Way. . . Tribute (DRAFT - Awaiting for Permissions) http://www.youtube.com/watch?v... Who knew back in 1986 a daytime television show would surface that would affect the lives of so many across the world. For twenty-five years your program has helped the culture grow and more importantly mature. Its amazing how we (your audience) have embraced both you and your shows platform. Over the course of time, you have become not only a part of the fabric of our culture; but also you have become a part of our lives much like a close friend. Through the years you have taken your viewers on a journey of inspiration, education and spiritual enlightenment. You have encouraged us to become better individuals and to be better stewards of all of our resources to help improve lives for all mankind. You encouraged us to face issues and injustices in our world that were once taboo and now have become commonplace and as a result we have the courage to live our best life lives and to do so more authentically. You have actually saved lives simply because of a kind word you shared or by sharing a personal experience you might have had in your own life. You have taught us the importance of living in a perpetual state of gratitude and how it changes the trajectory of our lives. On behalf of my music collaborator, thanks for blessing our lives with your truth, integrity and shared life lessons. Our lives have been greatly enriched.